6. Ear Speak Mesh Cover. This Huawei P9 Lite LCD screen replacement with front housing is brand new and original. And each item goes through strict inspection before shipping out. 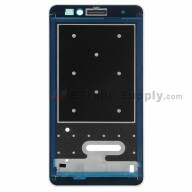 This Huawei P9 Lite LCD assembly with front frame is available in white and black, this is the white one. This screen replacement for Huawei P9 Lite is branded with Huawei logo. This screen assembly replacement is compatible with Huawei P9 Lite only. Please do not confuse it with other version. Please ensure choose the right color before placing the order. Special repairing tools are required for assembling or disassembling the Huawei P9 Lite.